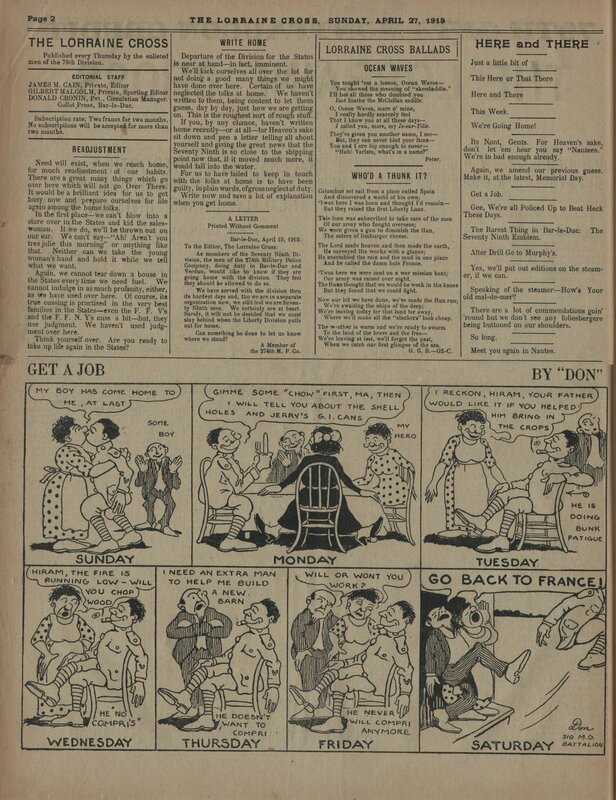 This web page contains the four pages of the Lorraine Cross newspaper dated April 27, 1919. 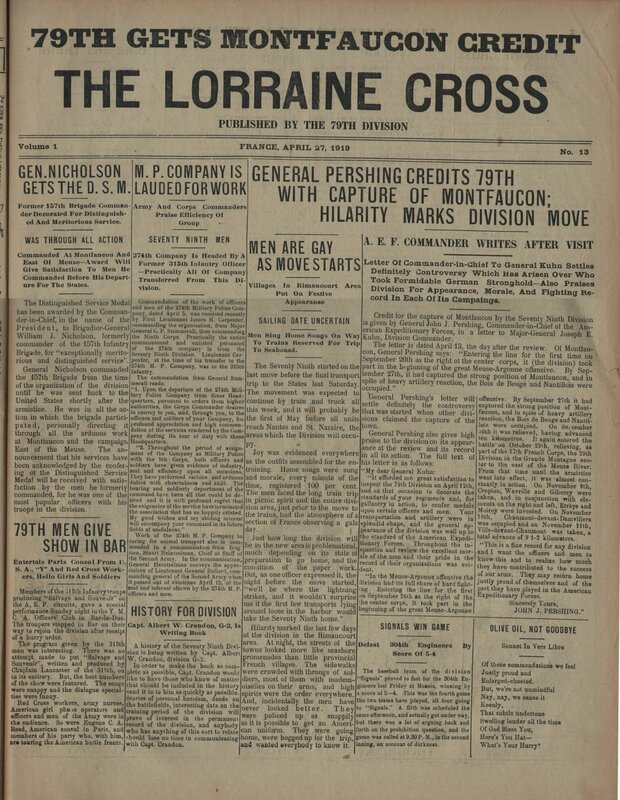 79TH GETS MONTFAUCON CREDIT THE LORRAINE CROSS PUBLISHED BY THE 79TH DIVISION Volume 1 FRANCE, APRIL 27, 1919 No. 13 GEN. NICHOLSON GETS THE D. S. M. Former 157th Brigade Commander Decorated For Distinguished And Meritorious Service. WAS THROUGH ALL ACTION Commanded At ~ontfaucon And East Of Meuse.Award Will Give Satlsiaction To glen He Commanded Before EIis Departur~ For The Slates. The Distinguished Service Medal has been awarded by the Commander-in-Chief, in the name of the Presi de n I, to Brigadier-General William J. Nicholson, formerly commander of the 157th Infantry Brigade, for "exceptionally merito rious and distinguished service". General Nicholson commanded the 157th Br^lgade from the time of the organization of the division until he was sent back to the United States shortly after the armistice. He was in all the action in which the brigade participated, personally directing it through all the arduous work at Montfaucon and the campaug East of the Meuse. The announcement that his services have been acknowledged by the confering at the Distinguished Service Medal will be received with satisf~ction by the men he formerly commanded, for he was one of the most popular officers with hi . troops in the division. 79TH MEN GIUE SHOW IN BAR Entertain Paris Consul From U S. A., "Y" And Red Cross Workers, Hello Girls And Soldiers Members of the .11 pith Infa^l^l~r~ troupe producing "Salvage and Souveuir" nu the A, E. F. circuits, gave a special performance Sunday night iu the Y. M. C. A. Officers' Club in Bar-le-Duc. The troupers stopped in Bar on their way to rejoin the division after receipt of a hurry order. The program given bsr the 315th men was interesting. There was no attempt made to put "8alvage and Souvenir", written and produced by Chaplain Lancaster of the 3I!itb, on in its entirety But, the best numbers of the show were featured. The songs were snappy and the dialogue specialties were lu^Dny. Red Cross workers, army nurses, American girl pho ye operators and officers and men of the Army were in the audience. So were Eugene C. A. Reed, American consul in Paris, and member^M of his party who, with him, era touring the l~u^lerican battle fronts. r M. P. COMPANY IS LAUDED FOR WORK . ^, Army And Corps Commanders Prairie Efiiclency Or Group SEVENTY NINTH MEN 274th Company Is wielded By A Former 315th Iufantry Otfloer .Practically All Of Company Transferred From Thls Di vision. Commendation Or the world of officers ad men of the 874th Military Polies Com any, dated April 5, was receivect recently y First Lieutenant James H. Carpenter, ommandiny the organization, from Major eoeralC.P.Summerall,thencornmanding M ala RnmA ~;;~n A on We he Niutb Corps. Practically the entir fin n n ~^7 ommissioned and enlisted personnel f the 274th company is from the evenly Ninth Division. Lieutenant C~r enter, at the time of his transfer to the 74th M. P. Company, was in the 316th ufantry. The commendation from General Sum erall reads: '1. Upon the departure of the 274th Mill- , ary Police Company from these Head uarters, pursuant to orders from higher uthorities, the Corps Commander desires lo convey to you, and, through you, to the t^r^lcers and soldiers of your Company, his l profound appreciation and high cowmen- ^] ation of the services rendered by the Com- , any during its tour ol duty with these . Headquarters. '62. Throughout the period of assign ment of the Company as Military Police with the 9th Corps, both officers and E oldiers have given evidence of industry, eal and efficiency upon all occasions. t They have performed various and arduous E sties with cheerfulness and skilb The t earing and soldierly deportment of the , ommand have been all that could be de- ; iced and it is with profound regret that l he exigencies of the service have terminated c he association that has BO happily existed. t My good wishes and my abiding irn~crest will accompany your command in its future ~ fields of usefulness." C Work of the 274th M. P. Company in caring for animal transport also is com mended in a communication from Brig. Gen. Stuart Heintzelman, Chief of Staff of n he Second Army. In the communication, General Heintzelman conveys the appre ciatiou of Lieutenant General Bullar.l, com mending general of the Second Army when it passed out of existence April 15, of th real and interest shown by the 274th M. P. officers and men. MEN ARE GAY AS MOVESTARTS Villages In Rimaucourt Area Put On Festive Appearance SAILING DATE UNCERTAIN HISTORY FOR DIVISION Capt. Albert W. Crandon, G-2, Is Welting Rnnlr A history of the Seventy Ni^Dth Division is being written by Capt. Fibers W. Crandon, division G-2. In order to make the book as c~m~lete as possible, Capt. Crandon would like to have those who know of matter that should be included in the history send it in to him as quickly as possible. Stories of personal heroism, deeds on the battlefields, interesting data on the trai~i^l^lg period of the division will prove of interest in the permaneu record of the division, and anybody who has anything of this sort to relate should lose no time in communicating with Cant. Ora~do4. GENERAL PERSHING CREOITS 79TH WITH CAPTURE OF MONTFAUCON; - HILARITY MARKS DIVISION MOVE ^. ^. A. E. F. COMMANDER WRITES AFTER VISA Letter Of Commander-in-chief To General Euhn Settlea Definitely Controversy Which Am Arisen Over Who Took Pormidable German Stronghold.Also Praises Division Por Appearance, Morale, And Fighting R~cord In Each Of Its Campal Jim ..u~ GURU ~ vet vv us To Tralnn Reserved For Trip To Seaboaad. The Seventy Ninth started on th last move before the final transpor trip to the States last Saturday. The movement was expected to continue by train and truck all this week, and it will probably be the first of May before all units reach Nantes and St. Nazaire, th areas which the Division will occu ^y- ~ Joy was evidenced everywhere s the outfits assembled for the enraining. Home songs were sung nd morale, every minute of the me, registered 10Q per cent. The men faced the long train trip n picnic spirit and the entire diviion area, just prior to the move to he trains, had the atmosphere of a section of France observing a gala av. ~ Just how long the division will e in the new areais problematical, uch depending on its state 0 reparation to go home, and th monition of the paper work ut, as one of fleer expressedit, the ight before the move started, 'we'll be where the lightning trikes, and it wouldn't surprise me if the first few transports lying round loose in the harbor would ake the Seventy Ninth home." Hilarity marked the last few days f the division in the Rimaucourt area. At night, the streets of the owns looked more like seashore romenades than little provincial rench villages. The sidewalks ere crowded with throngs of sol iers, most of them with n~ademiselles on their arms, and high pirits were the order everywhere And, incidentally the men hav never looked better. The were policed up as snappily asitis possible to get an Ameri- . can uniform. They were going . home, were hogged up for the trip, and wanted everybody to know it. . Credit for the capture of Montfaucon by the Seventy Ninth ~)l~on s given by General John J. Pershing, Commander-in-Chief of the ~nrican Expeditionary Forces, in a letter to Major-General Joseph E. Y Kuhn, Division Commander. The letter is dated April 13, the day after the review. Of M^ontf~^ur on, General Pershing says: "Entering the line for the first time ok September 26th as the right of the center corpse it (the division) took ~ art in the beginning of the great Meuse-Argonne offensive. By Se^D t ember 27th, it had captured the strong position of Monthucon, and In . pite of heavy artillery reaction, the Bois de Beuge and Nantillois were ccupied. 'General Pershing's letter will ettle definitely the controversy that was started when other di~i3 sions claimed the capture of the , town. General Pershing also gives high praise to the division on its appearance at the renew and its record , in all its action. 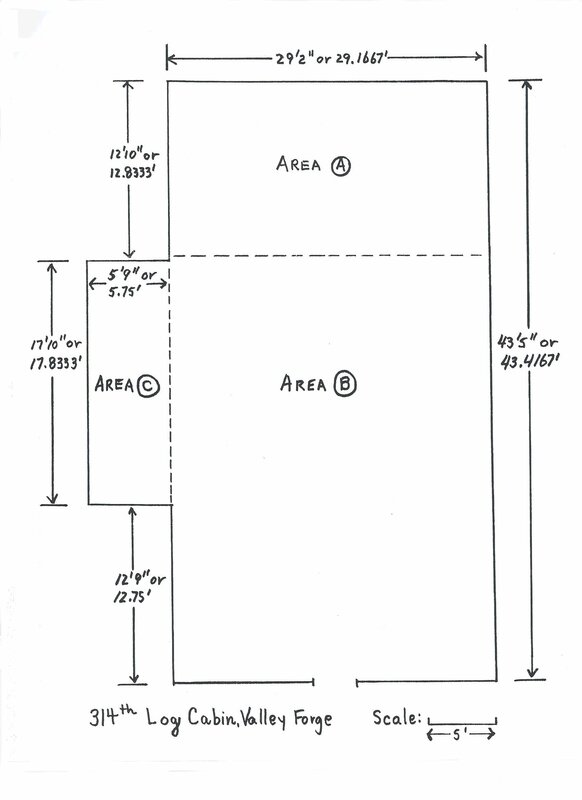 The full text of . his letter is as follows: , "My dear General Kuhn: lilt afforded me Breat satisfaction to inspect the With Division on April 12th and on that occasion to decorate the standards of your regiments and, for gallantry in action, to confer medals upon certain officers and men. Your transportation and artillery were in splendid shape, and the general appearance of the division was well up to the standard of the American E~peditionary Forces Throu^Ehout the inspection and review the excellent mora~e of the men and their pride in the record of their organizations was evident. "In the Meu^fie-Ar~onne offensive the division had its full share of hard fi~^rht~ng Entering the line for the first on September 26th as the right of the the center corps, it took part in the beginning of the great Meu~e-Argon~e SIGNALS WIN GAME Defeat 304th Ermine By ^' Moore of 5-~ The baseball team of the division "Signals" proved to fast for the 304th E~gineers last Friday at Maaois, winding by a score of 5.4. This was the fourth game the two Lamb have played, all four going to "Signals.' A 1itth was scheduled the same alteraoon, and actually got under way, but there was a lot of arguing back and forth on the prohibition quea , and the Camera called at 9.~ P. M.~he second inrush, on account of darkness. .~ offensive. By September 27th it had captured the strong position of Montfaucon, and in spite of heavy artillery reaetio^D, the B^t is de Beuge and Nantillois were occupied. On September Lath it was relieved, having advanced ten ki~ometres. It again entered the battle on October Huh, relieving, as part of the 1 7th French Corp^fi, the 29th Division in the Grande Montagne sector to the east of the Meuso River. From that time until the armistice went Into effect, it was almost constantly in action. On November 9th Crepion, Wavrille and C;ibercy were taken, and in conjunction with elemeats on the right and loft, Strafe and Moirey were invested. On November 10th, Chaumont-devant-Damriller~ was occupied and on Novembsr 11th, V~lle-de~ant-Chaumont Bras taken, a total advance of ~ 1-2 kilometers. "This is a fine record for any division and I want the officers and men to know this and to realize how rnuoh they have contributed to the BucceBs of our arms. They may return home Justly proud of themselves and of the part they have played in the American Expeditionary Eorces. Sincerely Yours, JOHN J. PERSHING." OLIVE OIL, NOT GOODBYE Sonnet In Vers Librs Of these commendation we fed Justly proud and Enlarged-che~ted. But, we're not u^D,^Isindful Nay, nay, we sense it Keenly,, That subtle undertone Swelling louder all the time Of God Bless Your EIere's You Hat. What's Your r . Page; 2 ~ ' ~ . !71 , . A- - . , . .. - . ,, ._. - - T Et E L OR Ret I N E a R O. ~ 8, St~NDA~, Spats 27, 1918 ^\ THE LORRAINE CROSS Published every Thursday by the enlisted men of the 79^ih Division. i EDITORIAL STAFF ~ JURIES M. CAIN, Private, Editor 1 GILBERT MALCOLM, Private, Sporting Editor i DONALD CRONIN, Pvt., Cireu~ation Manager. Collot Press, Bar-le-Duc. Subscription rate; Two francs for two months. ~ No subscriptions drill be accepted for more than ] two months . _ . . - READJUSTMENT ~ 1 Need will exist, when we reach home, for much readjustment of our habits. There are a great many things which go ~ over here which will not go Over There. I It would be a brilliant idea for us to get busy now and prepare ourselves for life again among the home folks. In the first place.we can't blow into a store over in the States and kid the sales~roman. If we do, we'll be thrown out- on our ear. We can't say."Ah! Aren't you tres jolie this morning" or anything like that. Neither can we take the young woman's hand and hold it while we tell what we want. Again, we cannot tear down a house in the States every time we need fuel. We cannot indulge in as much profanity, either, as we have used over here. 0~ course, its true cussing is practised in the very best families in the States.even the F. F. V'9 and the F. F. N. Y's cuss a bit.but, they use judgment. We haven't used judgment over here. Think yourself over. Are you ready to take up life again in the States? ^. . ^. GET A JOB ^. no BOY H~95. COLLIE I~IO~lE TO) A_ WE, AT L~S~ . ~ am it' SUNDAY ~;~11 HE Nil ! . ,' _~ CG~PP~^l'S _ WEDNESDAY WRITE HOME Departure of the Division for the States is near at hand.in fact, imminent. We'll kick ourselves allover the lot for not doing a good many things we might have done over here. Certain of us have neglected the folks at home. We haven't written to them, being content to let them guess, day by day, just how we are getting on. This is the roughest sort of rough stuff. If you. by any chance, haven't written home recently.or at all.for Heaven's sake sit down and pen a letter telling all about yourself and giving the great news that the Seventy Ninth is so close to the shipping point now that, if it moved much- more, it would tall into the water. For us to have failed to keep in touch with the folks at home is to have been guilty, in plain words, of grossneglectof duty. Write now and save a lot of explanation when you get home. A LETTER Printed Without Comment Bar-le-Duc, April 19, l919. To the Editor, The Lorraine Cross: As members of the Seventy Ninth Division, the men of the 274th Military Police Company, doing duty in Bar-le-Duc and Verdun, would like to know if they are going home with the division. They feel they should be allowed to do so. five have served with the division thru id hardest days and, tho we are in aseparate organization now, we still feel we are Sevent~ Ninth men. We certainly are at heart. Surely, it will not be decided that we must shy behind when the Liberty Division pulls out for home. Can something be tone to let us -know where we stand? A Member of the 274th M. P. Co. 1 LORRAINE CROSS BALLADS ^ OCEAN WAVES You taught 'em a lesson, Ocean Waves. You showed the meaning of "skeeda~ddle." I'll bet all those who doubted you Just loathe the McClellan saddle. O. Ocean Waves, mare o' mine, I really hardly scarcely feel That I know you at all these days. I called you, mare, my I~sur-Tille. They've given you another name, I see. glut, they can never blot your fame. You ant I are big enough to sneer. "Huh Varlets, what's in a namer' Peter. WHO'D A TRUNK IT? Columbus set sail from a place called Spain And discovered a world of his own; 'lwas here I was born and thought I'd remain. But they raised the first Liberty Loan. This loan divas subscribed to talkie care of the men Of our army who fought overseas; We severe given a gun to diminish the Hun, The eaters of limburger cheese. The Lord made heaven and then made the earth, He surveyed His works with a glance; He assembled the rain and the mud in one place And he called the damn hole France. 'Twas here we were sent on a war mission bent; Our army was raised over night. The Hues thought that we would be weak in the knees But they found that we could fight. Now our bit we have done, we've made the Hun run; We're awaiting the ships of the deep; We're leaving today for that land tar away, Where we'll make all the "slackers" look cheap. The weather is warm and we're ready to swarm To the land of the brave and the free. We're leaving at last, we'll forget the past, When we catch our first glimpse of the sea. G. G. B..G2-G. Glib DEE SOLED C Ho )! At RST, ~1P,, ~ HE ~ A, r , WILL SPELL FOCI VIOLET THE SHELL GAS ONCE JERRY'S G. 1. CAblS , 5ca MONDAY I ALEC) ~~ EXTRA ~1~1 WILL OR WONT YOV ) 10 HE LP WE 13UI L Cay WOf^2~K ;~ r / ^r~.~ ~ In E W ~ it\ THURSDAY ~ HERE and THERE ~ Just a little bit of .~ Tnis Here or That There A. ~~ Here and There This Week. We're Going Homel _ Its Wont, Gents. For Heaven's sake, don't let 'em hear you say "Nanlees." We're in bad enough already Again, we amend our previous guess. Make it, at the latest, Memorial Day. Get a Job. Gee, We're all Policed Up to Beat Piece These Days. The Rarest Thin in Bar-le-Duc: The Seventy Ninth Emblem. After Drill Go to Murphy's. Yes, we'll put out editions on the steamer, if we can. Speaking of the steamer.How's Your old mal-~le-mer? There are a lot of commendations goin' 'round but we don't see any foliesbergere being buttoned on our shoulders. So long. Meet you Again in Nantes. BY "DON" f ~ . ~ I RECK~t~, HIRAM, FOUR FATHER) SHOULD LIKE IT 1~ YOU HELPED'. .LIMIT BRING liter Ail ~ ICE IS DO I ~ ~, BUNG FATIGUE ~ . _ ~ TUES DAY A . ,, . . ......~ GO BACK TO FRANCE !